Home Tags Posts tagged with "charlie hebdo protests"
Fresh protests against French magazine Charlie Hebdo‘s cartoon depicting the Prophet Muhammad have sparked in Niger. At least two churches have been set on fire in the capital, Niamey. 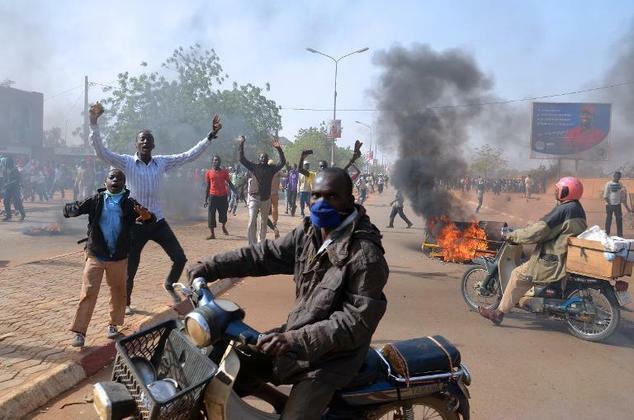 Saturday’s protests began outside Niamey’s grand mosque with police using tear gas a day after at least four were killed in the second city of Zinder. The French embassy has warned its citizens to stay indoors. Last week, Islamist gunmen killed 12 people at Charlie Hebdo‘s Paris offices. Eight of them were journalists. Subsequent attacks in Paris killed another five people, four at Jewish supermarket HyperCacher. The cover of Charlie Hebdo‘s latest edition, published after the attack, featured a cartoon of the Prophet Muhammad weeping while holding a sign saying “I am Charlie”. Many Muslims see any depiction of Islam’s prophet as offensive. Protests against Charlie Hebdo were also seen on January 16 in Pakistan, where protests turned violent in Karachi, the Sudanese capital of Khartoum and the Algerian capital, Algiers. People in Somalia took to the streets on January 17. In Niger, a former French colony, hundreds of demonstrators gathered at Niamey’s grand mosque, shouting “God is Great” in Arabic. At least two churches were set on fire – similar to Friday’s demonstration in Zinder where protesters also raided shops that were run by Christians. The French cultural centre in Zinder also came under attack. The centre’s director, Kaoumi Bawa, said an angry crowd of around 50 people had smashed the building’s door and set fire to the cafeteria, library and offices. Three civilians and a police officer have been killed in violent protests against French magazine Charlie Hebdo in Niger’s second city of Zinder, officials say. A number of churches and the French cultural centre were among several buildings raided and set alight. Friday saw protests across the Muslim world over Charlie Hebdo‘s publication of a cartoon of the Prophet Muhammad on its first issue after last week’s attack in Paris. Twelve people were killed in the attack at the Charlie Hebdo’s offices. The cover of the magazine’s latest edition, published after the attack, featured a cartoon of the Prophet Muhammad weeping while holding a sign saying “I am Charlie”. Protests against the magazine were also seen on Friday in Pakistan, where protests turned violent in Karachi, the Sudanese capital of Khartoum and the Algerian capital, Algiers. One policeman and three civilians were killed in the protests in Zinder after Friday prayers, a police source told Reuters. “Some of the protesters were armed with bows and arrows as well as clubs. The clashes were very violent in some places,” the source added. AFP quoted a minister as saying dozens of people had been injured. Local residents told Reuters that demonstrators had set fire to churches and raided shops that were run by Christians. 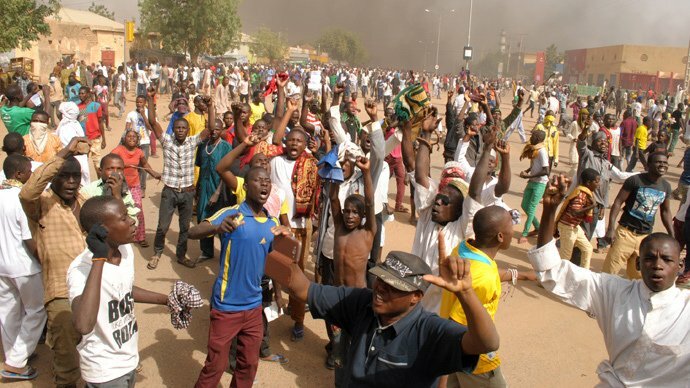 “The protesters are crying out in local Hausa language: Charlie is Satan – let hell engulf those supporting Charlie,” a local shopkeeper said by telephone. The French cultural centre there also came under attack.